Workers and students protested in Paris on Tuesday against the policies of French president Emmanuel Macron, including labor reforms and cuts in social expenditure. The call for protests was given by trade unions such as General Confederation of Labour (CGT), Worker’s Force (FO) and Solidaires, along with students’ unions such as the National Union of Students of France (UNEF) and Union National Lyceenne (UNL). The protesters demanded an increase in wages, pensions, gender equality and an end to privatization. According to their estimates, more than 300,000 people, including workers, students, retirees etc, participated in marches in more than a hundred places in the country. As many as 50,000 people protested in Paris alone. The police responded brutally, with armed personnel charging into the crowd and injuring a number of protesters. . The protesting unions had given the call for action at a meeting on August 30 and issued a joint statement condemning Emmanuel Macron’s “ideological policies targeting the destruction of our social model, favoring notably the explosion of inequality and the breaking of collective rights”. The CGT demanded that the government implement a comprehensive wealth sharing policy. The various confederating units of CGT in the health, education, transport, postal & communication and metallurgy sectors, among others, actively participated in the protests. Students and youth too took part in large numbers. A joint press release on October 5 signed by various groups, including the UNEF, UNL, Solidaires étudiant·e·s, MJCF (Mouvement Jeunes Communistes de France), Youth Network of the Left Party, etc stated, “Faced with reforms that deny us all rights in the future by closing the doors of higher education, by.. condemning us to precariousness throughout our lives (during our studies, during our professional integration but also at the time of retirement), the unions and young people, signatories of this text, call for a protest on October 9”. According to critics, Macron’s reforms have had a devastating effects on workers, pensioners, students and families all across the country. He has slashed housing benefits, imposed taxes on pensions and restricted entry to university admissions. Various students organizations have been protesting against the derailment of universal access to education in the country. A rampant plan for privatization is also underway in the fields of energy and transportation. Privatization of airports and similar efforts in the railway sector had earlier invoked widespread protests from aviation workers and rail workers. Macron has also made conditions far more difficult for immigrants, refugees and asylum seekers in France. In May, tens of thousands of people protested in 160 different locations in France against Macron’s reforms to slash 120,000 public sector jobs, reduce the accessibility of students to higher education and privatize French national railways. Hey Buddy!, I found this information for you: "French workers, students take to the streets against Macron’s ‘reforms’". 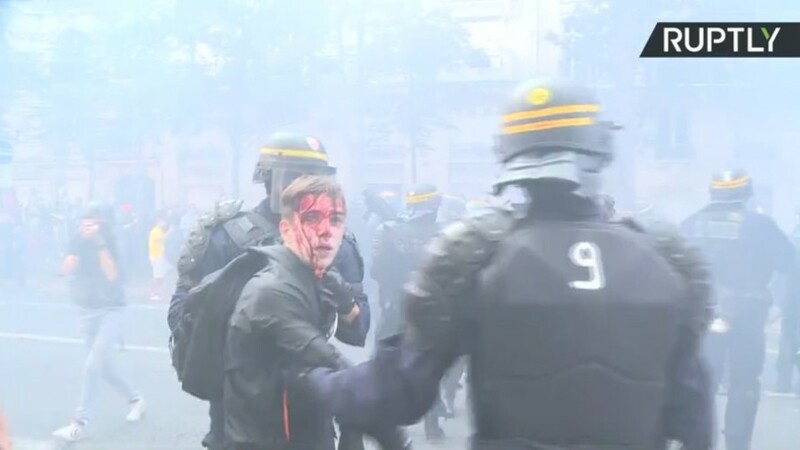 Here is the website link: https://peoplesdispatch.org/2018/10/10/french-workers-students-take-to-the-streets-against-macrons-reforms/. Thank you.